The Château de Montségur (English: Castle of Montségur) is a former fortress near Montségur, a commune in the Ariège department in southern France. Its ruins are the site of a razed stronghold of the Cathars. The earliest signs of human settlement in the area date back to the stone age, around 80,000 years ago. Evidence of Roman occupation such as Roman currency and tools have also been found in and around the site. Its name comes from Latin mons securus, which evolved into mont ségur in Occitan, which means "safe hill". In the Middle Ages the Montsegur region was ruled by the Counts of Toulouse, the Viscounts of Carcassonne and finally the Counts of Foix. Little is known about the fortification until the time of the Albigensian Crusade. In about 1204, Raymond de Péreille, one of the two lords of Montségur, the other being his cousin Pierre-Roger de Mirepoix, decided to rebuild the castle that had been in ruins for 40 years or more. Refortified, the castle became a center of Cathar activities, and home to Guilhabert de Castres, a Cathar theologian and bishop. In 1233 the site became "the seat and head" (domicilium et caput) of the Cathar church. It has been estimated that the fortified site housed about 500 people when in 1241, Raymond VII besieged Montsegur without success. 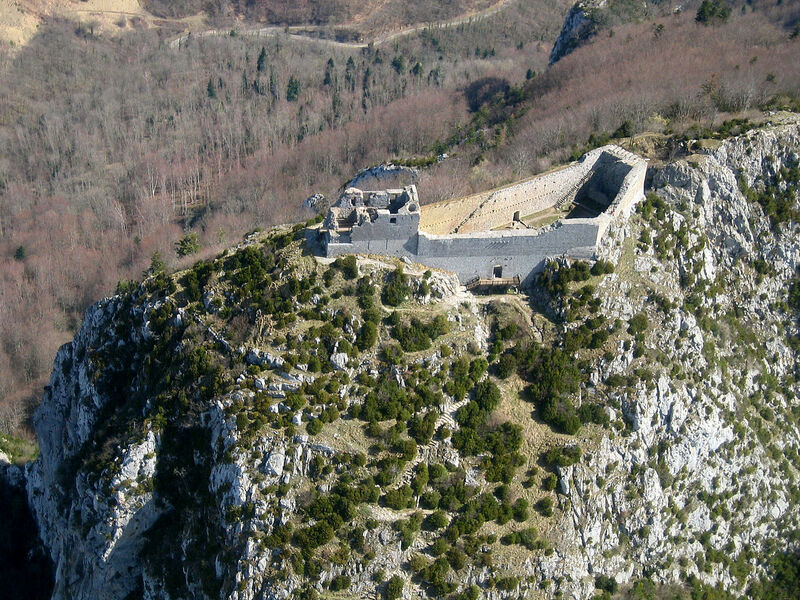 The murder of representatives of the inquisition by about fifty men from Montsegur and faidits at Avignonet on May 28, 1242 was the trigger for the final military expedition to conquer the castle, the siege of Montségur. In 1242 Hugues de Arcis led the military command of about 10,000 royal troops against the castle that was held by about 100 fighters and was home to 211 Perfects (who were pacifists and did not fight) and civilian refugees. The siege lasted nine months, until in March 1244, the castle finally surrendered. Approximately 220 Cathars were burned en masse in a bonfire at the foot of the pog when they refused to renounce their faith. Some 25 actually took the ultimate Cathar vow of consolamentum perfecti in the two weeks before the final surrender. Those who renounced the Cathar faith were allowed to leave and the castle itself was destroyed. At the base of the mountain, in the "Prat dels Cremats" (Occitan for "Field of the Burned"), a modern stele commemorates the death of the victims; it is inscribed "Als catars, als martirs del pur amor crestian. 16 de març 1244" (Occitan for "The Cathars, martyrs of pure christian love. 16 March 1244"). "held by about 100 fighters and was home to 211 Perfects"
The siege itself was an epic event of heroism and zealotry, akin to that of Masada, with the demise of the Cathars symbolized by the fall of the mountain-top fortress.